Carnations are well-known for their beauty and fragrance. These large blooms have velvety textured petals with a robust fragrance. The bouquet includes 18 enchanting carnations with green foliage. 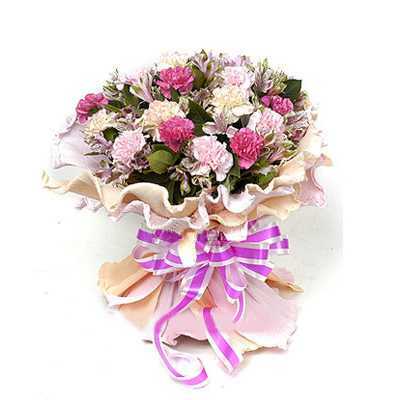 The bouquet makes for a wonderful surprise for your loved ones. The colorful flowers will embrace your relation with love and brightness. It looked better than shown here.. brilliant quality! I find the colour combination very intriguing, mostly for the subtle CLASSY feel it establishes. Liked, Ordered, Received and Satisfied.